Apricots are a common street tree in Santa Fe. Many years we don’t get fruit, because a late frost zaps the flowers before they can be pollinated. But this year we’ve had an abundance of apricots, and they’ve been ripening gradually, over a period of six weeks. So much fruit falls to the ground, unappreciated (perhaps even cursed) by the home owners who own the trees. I’m happy to do a little cleanup and glean the best of the bunch. 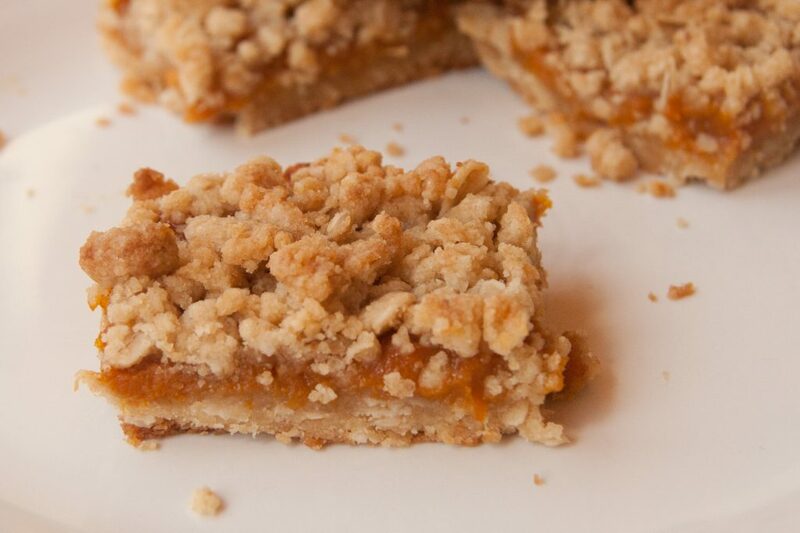 I give you here the first of several summer apricot recipes: apricot crumble squares. This is what August in Santa Fe tastes like. We didn’t eat apricots in my family growing up. I’m not sure why, but it just wasn’t a thing. As an adult (am I grown-up yet?) I love the flavor and texture: intense, rich, dense, smooth, and just the right amount of sweet. Often when you forage for fruit, you gather a combination of ripe fruit and over- or under-ripe fruit. This recipe makes even less than perfectly ripe apricots taste gloriously rich and sweet. Note: If you don’t have time to play with your apricots right away, rinse and freeze them for later. The color may be slightly less bright, but the flavor should still be good. In a sauce pan, combine the pitted apricots, sugar, and liqueur. Cook over medium heat until the fruit is very soft, then transfer the fruit to a blender and purée until smooth. Pour the fruit mixture into a bowl and put the bowl in the freezer, so it sets up a bit. In a bowl, combine the flour(s), brown sugar, salt, and oatmeal. Stir the ingredients together with a fork. Add the melted butter, and using the fork, combine all the ingredients to create a crumbly dough. Line a 9″ x 13″ baking pan with parchment paper. Seriously, don’t skip this step. It makes it SO much easier to get the bars out of the pan. Cut the parchment paper large, so there’s overhang on all sides. These will be your handles when you lift the bars. Press 2/3 of the crumbly dough into the bottom of the pan, to create your bottom crust. Make sure to press it firmly into all the corners. You want this layer to be about 1/4″ thick. Next, spread the chilled apricot purée over the bottom crust, covering the entire surface evenly, This layer should also be about 1/4″ thick. Finally, crumble the remaining 1/3 of the dough on top of the fruit. It shouldn’t form a solid layer; you want the fruit to show through. Bake for 25 – 30 minutes or until the topping is golden brown. (If you’re using acorn flour, the topping will be dark brown from the get-go, so ignore that last bit.) Remove the bars from the oven and let them cool for 10 – 15 minutes, then lift the ends of the parchment paper out of the pan and set the bars on the counter to continue cooling. These are great with tea, on a picnic, or for dessert, with a scoop of ice cream on top.